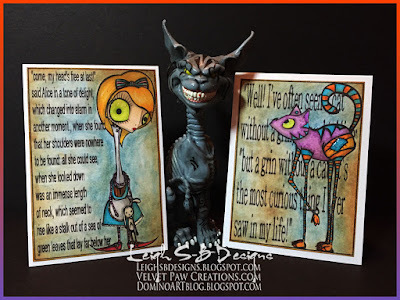 Today I'm sharing 2 notecards featuring Lily's quirky Alice with a Long Neck and Cheshire Cat and the matching verses. I just adore these designs! More photos and deets are below the Blog Hop list. Leigh Snaith-Brunton - you are here! 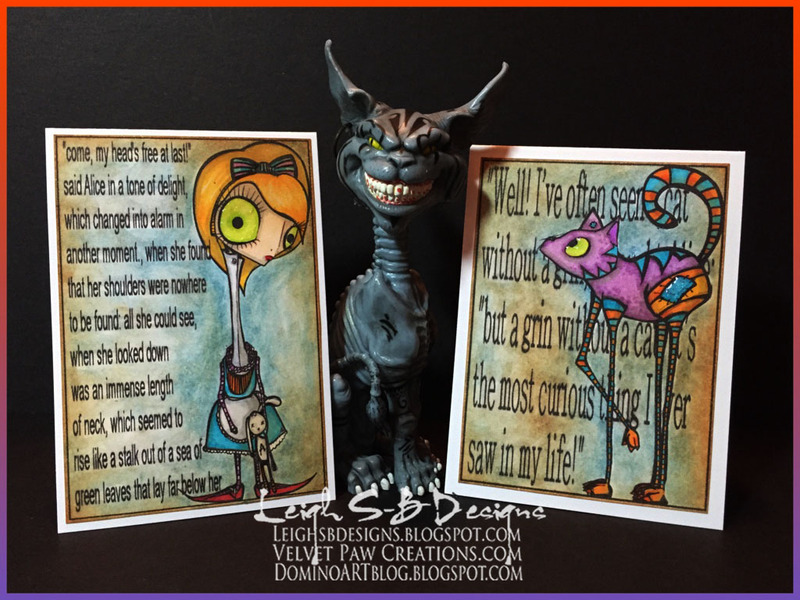 I designed the layout of my notecards in Photoshop CS6, the Cheshire Cat is ATC size (2.5 x 3.5") and the Alice is slightly longer than an ATC and printed them out onto white Neenah cardstock. The images are coloured with Copic markers and the backgrounds coloured with a Derwent chalk pencil and blended with a Dove Blender pen. Tea Dye Distress Ink was applied with a foam applicator and I applied Vive Pearl Magic Transparent White to small areas of each image to add a touch of magical sparkle. Both panels were then mounted onto white folded cards with Scotch Quick Dry glue. Thank you for hopping with me in loving memory of Lily and sharing your wonderful creations. Lily will live forever in our hearts and in our art! Wonderful note cards, love the colors. Love these Leigh - a great tribute! RIP Lily. Lovely projects in Lily's honor! The book quotes are perfect for those images. Love the soft chalky backgrounds! Your cards are so beautiful, great tribute ! Two great cards Leigh...what a wonderful way to pay tribute to Lily and her artwork!